DEARBORN, Mich., Nov. 19, 2012 – Ford's EcoBoost turbo-charged gasoline engines provide a simple way to increase fuel efficiency, decrease environmental impact, without changing anything about the way one fuels their ride. On Monday, Ford announced having manufactured its 500,000th EcoBoost-Equipped Vehicle, reaching a milestone in the company's quest to be the undisputed industry fuel economy leader. The 500,000th EcoBoost-Equipped Vehicle manufactured by Ford was a 2013 Ford Escape that rolled off the line at Ford’s Louisville Assembly Plant. Ford is in a marketing contest with Toyota and Honda and sees high fuel efficiency as the path to unseat those two companies. Ford's quest to develop vehicles with the highest fuel efficiency isn't just about proactive compliance with government regulations in the U.S. and abroad. It is also a strategem to appeal to Toyota's and Honda's existing customers, who tend to buy from those companies based on fuel efficiency. By the end of 2012 Ford will be selling eight vehicles with fuel efficiency over 40 miles/gallon. In 2013, Ford says that 90% of its vehicle line-up will have an EcoBoost option. Two examples are the Ford Fusion hybrid and Ford C-MAX Hybrid, both of which have 47 miles/gallon fuel efficiency. The C-MAX Hybrid is a direct competitor to the Toyota Prius v, and beats that car in fuel efficiency. Ford’s global EcoBoost engine family includes the award-winning 1.0-liter three-cylinder, 1.6-liter and 2.0-liter four-cylinder engines, and the powerful 3.5-liter V6. The technique is to apply turbocharging technology not for the purpose of speed, speed and more speed, but to use small gasoline engines for high fuel efficiency, while using the turbocharger to get acceptable power levels. While many drivers want higher fuel efficiency, they seem unwilling to sacrifice power and performance to get it. EcoBoost was introduced in July 2009 with the 3.5-liter V6 EcoBoost engine in the 2010 Taurus SHO. There were 9,946 EcoBoost-equipped vehicles sold that year, in 2010 sales increased to 15,117 units, and in 2011 Ford sold 127,683 EcoBoost-equipped vehicles in the U.S. This high growth rate isn't just happening in the U.S. 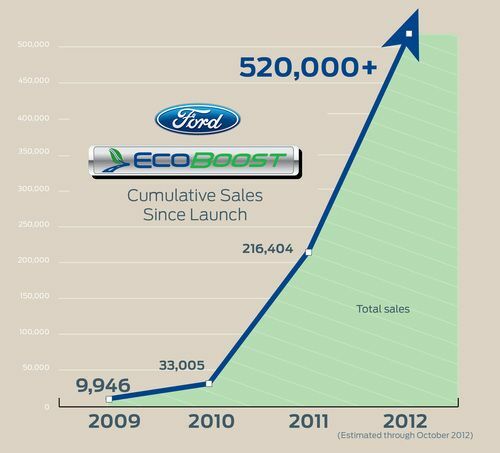 In 2013 the Fusion with EcoBoost will launch in South America, making the EcoBoost available in every region Ford serves. In Europe, Ford plans to triple the production of its vehicles equipped with EcoBoost engines to approximately 480,000 in 2015, from 141,000 last year.